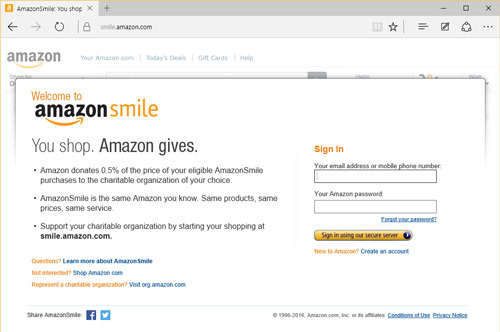 WHAT: Amazon donates 0.5% to your charity if you use smile.amazon.com. WHO: Any Amazon customer can help the railroad each time they shop Amazon. COST: It costs you nothing. Same great Amazon prices, same great Amazon service. Amazon makes the donation from their pockets. Amazon is one of the most popular on-line retailers in the world. The Nevada Northern Railway Foundation is pleased to be part of the Amazon Smile Foundation's program for non-profits, such as us. The Amazon Smile Foundation will donate 0.5% of your purchase to the charity of your choice. This is possible each time you shop on http://smile.amazon.com. You have to use http://smile.amazon.com. Don't forget the SMILE rather than the usual WWW. It is as easy as that! 1. To sign up, visit http://smile.amazon.com. The entire shopping experience, products, and prices are identical to regular Amazon. 2. Sign in to your existing Amazon account (or create one, if you are new to Amazon). You will be asked to identify your favorite charity. You’ll see a screen like the one below. In the search box enter “Nevada Northern Railway.” You will see a list of possible matches. Select the charity of your choice. We are currently listed as the Nevada Northern Railway Foundation. 3. You will now see the Amazon Smile logo in the upper left corner. The rest is easy. Just start shopping. Once you’ve selected your charity then everything in Amazon behaves the same way as you have always been used to. Remember, you get the same great Amazon prices and the same great Amazon services. 4. Remember to use smile.amazon.com. each time you shop. You have to think about it the first few times you return to Amazon, then it will come naturally. If you don't hit smile.amazon.com, and you don't see the Amazon Smile logo, then we will not get credit for your purchases. Remember to SMILE rather than WWW. 5. Feel free to share this information with all of your friends.